Download a Show Description pdf here. 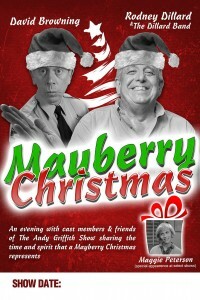 MAYBERRY CHRISTMAS is a traditional, old timey Christmas show with great music, humor, audience interaction & holiday inspiration. This special concert features “The Andy Griffith Show” stars Rodney Dillard (one of the original Darling boys) and Maggie Peterson (Charlene Darling). 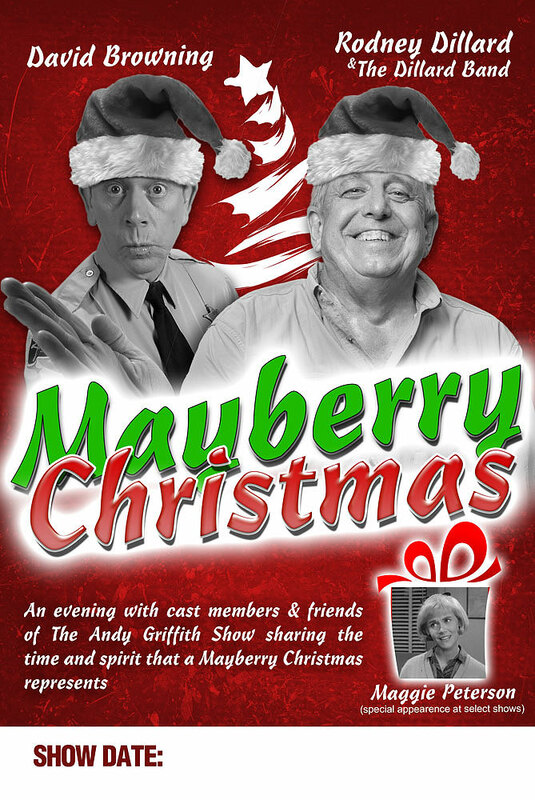 Beverly Dillard, The Dillard Band and David Browning (The Mayberry Deputy) are also part of this memorable holiday show providing your audience with the essence of what a Mayberry Christmas means to all of us. The show includes pre-show mingling by Mayberry Deputy (David Browning), traditional Christmas music like I’ll be Home with Bells On, Angels We Have Heard on High and Silent Night, bible readings, comedy skits and inspirational stories. The show runs about 1 – 2 hours, depending on your event, and is followed by a meet & greet after the show with pictures and recordings available for purchase. STAGING / SET: A simple, living room/home style set and screens for visual DVD selections from the public domain Ben Weaver Christmas episode of The Andy Griffith Show, which frames this show. Sound checks will need to be scheduled before the show.